contactless card protector, ultra thin, flexible protection for your cards. 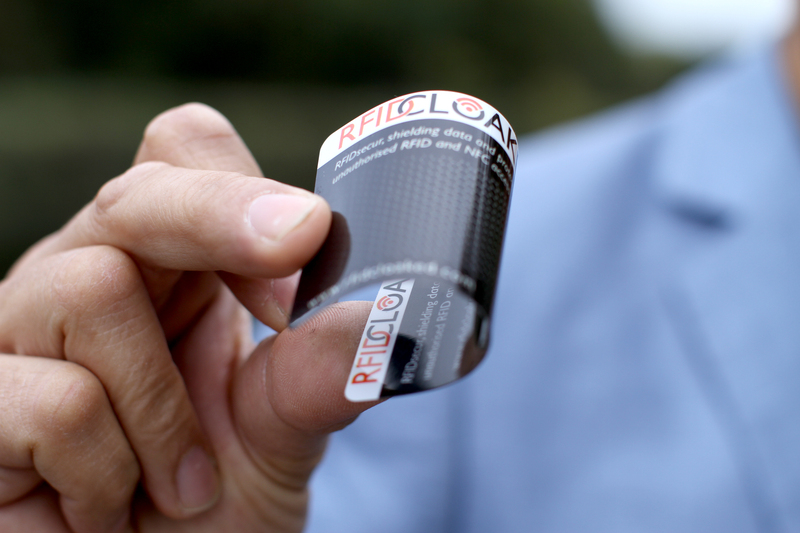 Here is our ultra-thin flexible RFIDsecur™ contactless card protector. Welcome to the thinest, lightest, most effective RFID contactless card protector, made from our high tech RFIDsecur™ film. Using our card protects your contactless bank cards, RFID security passes and keys from being fraudulently scanned or copied. Also protecting you from card clash and inadvertent payment with the wrong card. We have multiple designs, each are incredibly thin and effective. We invite you to see it in action here in a short 42 second video. It is only 270 microns thick, that’s 1/3rd of a mm or 0.010 inches!, in contrast contactless bank cards are 760 microns or 0.76mm that’s 3X thicker. Which means our card is protecting you, yet incredibly it is only one third of the thickness of your bank card! So don’t bother with other bulky contactless card protectors that only protect bank cards. We suggest you protect all of your contactless and RFID cards, including security passes and keys with our card protector. Our simple effective RFID blocking card, protects against both 13.56Mhz (bank industry standard) and 125Khz (security ID card and key pass standard) frequencies. Please check your bank card now, if it has a contactless payment symbol, Pay Pass or similar to this one opposite. You should protect it from the risk of unauthorised or accidental access because without it, you could fall victim to identity theft and suffer financial loss. Why our contactless protection card? RFIDsecur contactless card protectors are easily placed alongside your contactless bank card, in your wallet, purse or ID holder. Thereby guaranteeing protection against theft of your information or unauthorised payments, yet still allowing you – and only you! – full use of your cards. You can even slip it into your ePassport to protect that. Yes it is extremely versatile because it is so thin and light. This is why we were successfully funded on Kickstarter by over 200 backers in 2016. We invite you to join them and all our happy customers. Simply purchase the best card protector on the market here in our store!